and realized that those tall spindly looking teenager plants are not necessarily the sign of the healthiest plants possible. They show classic symptoms of being LEGGY, and I don't mean they have beautiful gams. 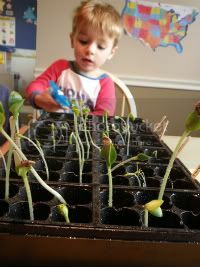 (my other 'mistake' was starting from seed several plants that would probably have done better being directly seeded outside during planting time--but I think that the kids really enjoyed seeing the different types of babies, so we'll let that one slide ). Leggy seedlings are tall, thin-stemmed, and sometimes bent over. Why Do Seedlings Become Leggy? Seedlings start seeking light as soon as they pop out of the soil. Very eager to soak up that light so that they will survive, they lean and bend toward the light source. If the light is dim, they will start to grow tall and spindly in their efforts to reach up. What they sacrifice with height is stem width. Long, skinny stems will not do as well holding up to the conditions outside, and your plant will not be as healthy and strong as it needs to be to combat pests and diseases, wind, rain, and all of nature's other challenges. What Can Be Done To Prevent Legginess? One of the best ways to grow seedlings indoors is to use a 'growlight'. Here is an example of a growlight setup. You can make one yourself, using a florescent light that has both a 'hot' and 'cold' bulb, and building a mechanism which raises the light up as the seedlings grow. Here's my problem, though...i don't have a growlight setup and I don't plan to make one this year...if ever! If you've got the resources to make one, I say go for it. 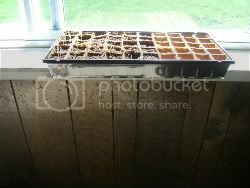 I am being stubborn and would like to try my luck at windowsill seedlings. After all, what did gardeners do if they wanted to start seeds before they had electricity? Maybe that's a stretch, but it's never far from my mind that if I ever needed to survive without electricity, I could. So knowing how to grow strong seedlings without extra gadgets or power can't do any harm. I'm not saying never, and maybe as I get really into this gardening thing, I'll try fashioning a growlight. But for now, it's good old fashioned sunlight for the Little Hands Garden! 1. 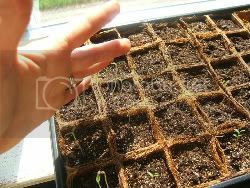 Place your seedlings in a south facing window. *make sure your indoor animals are either kept out of the room, or watched carefully. They adore knocking over fragile, precarious-looking objects from sunny windows. Although...this furry love is not looking very threatening. 2. Turn your seedlings daily so that they are not 'reaching' toward the sun in the same direction every day. 3. Try to urge seedlings that are too tall to grow thicker by brushing your hands over them a few times a day or placing an oscillating fan to blow gently on them for a few hours every day. This tricks the plant into thinking that it is growing in a windy environment and releases chemicals in the plant to grow thicker stems to be better able to withstand the supposed windy environment. 4. 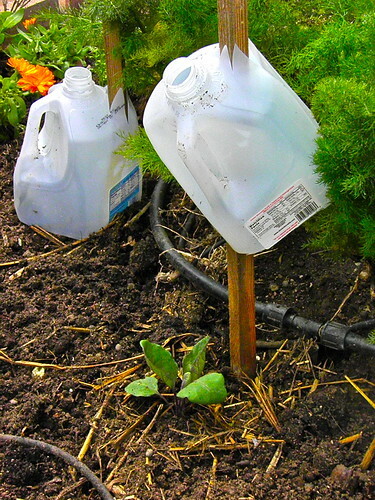 Keep your seedlings happily watered! 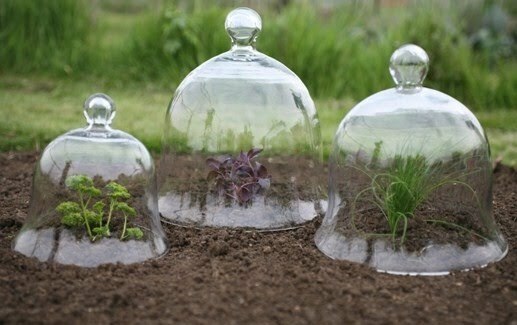 Keep their soil damp, misting them once or twice a day (I have found that being in a south facing window warms their soil considerably, and I mist them twice a day). You don't want soaking wet soil, just damp and airy. If you let seedlings go dry, they will put effort into survival and you'll lose potential growth and strength. Baby the seedlings for now, and save the toughening up for later, when you harden them off. With these tips in mind, come back soon to see how our seedlings have done! In this mini greenhouse we have 3 types of tomatoes: Brandywine, Yellow Pear, and Super Sweet 100 Hybrid. We also have 3 types of marigolds: Jaguar, Lemon Drop, and French Dwarf. The marigolds will be our superheros in the garden when they help us deter pests! The rest of our veggie seeds are patiently waiting for warmer weather in order to be planted directly into the garden! 2. Add the onions and cook for 5 minutes, stirring occasionally. 3. Add the sugar and cook for another 5 minutes or until onions start to caramelize. 4. Remove the onions to a plate and add the mushrooms, garlic and 1/2 tsp salt to the pot. Cook for 3 minutes or until the water from the mushrooms start to evaporate, then remove to a plate and set aside. 6. Add the onions and mushrooms to the pot to combine and cook until heated through. *Cooking in the same pot allows all of the flavors to combine. I think Joan Gussow has a lot to offer to those trying to grow their own food. Her experience and personal stories promise to inspire! I have a complicated reader relationship with Joan Gussow. I want to say that I love her writing all the way to the end of the earth, but I do recognize some of her quirks that many might find irritating. In some ways, she seems to be a nit-picking old lady, the type you don't want to be neighbors with, for fear that she'll make your life hell. She is very opinionated, a right we all have but especially at the ripe age of 80-something, and there are many times while reading that I get the distinct impression that whatever she says, GOES in the lives of anyone around her. BUT. That is all the negative I will say. Because, darnit, I can't help it. I really, really love her stories. She writes with pure heart, holds nothing back, and openly shares everything she's ever learned about food, gardening, our food system, our environment. She is full of facts and important knowledge, and she's not afraid to stick her neck out with unpopular ideas (she wrote and researched many facets of our current agricultural systems long before the topic became mainstream, often facing tough critics). She also shares very personal stories about her sons and late husband, and shows time and again her humanness. Growing, Older, is a book I will read often. 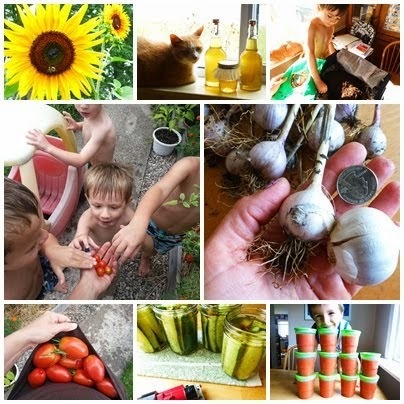 Gussow ponders many of the issues a human being faces as they grow past 'old' into 'elderly', yet maintains her fierce independence and continues to grow most of her food in her (granted, huge) backyard. The Hudson River lies directly behind her, and throughout her insightful chapters there is the constant background threat of her garden being flooded. Flood, it does. More than once Gussow's gardens have been utterly destroyed by the river's rising banks. The work she must do to repair the damage is exhausting to read about, and yet she's had to do it more than once, and she willingly does it. The answers to the question "Why don't you just MOVE?" emerges in her reflections. For one, she respects what nature has to dish out, and feels she needs to work with the forces around her. Two, the view of the river is so beautiful to her that she's willing to do what she must to live with such a gorgeous natural presence that fills her soul, even if at times it wreaks incredible damage on her livelihood. Many people wouldn't even have the option to move, so to see her succeeding in raising lots of food in a not-always-very-ideal environment is encouraging. This 'old lady' has a lot of good knowledge to offer, and I feel her words on a personal level. There is so much focus on the negative aspects of growing old that it's no wonder everyone's so terrified of it. Joan Gussow is not terrified of age, but ecstatic about what the years have given her. I've adopted her as one of my role models, hoping I have the wonderful opportunity to also grow old, along with my gardens.